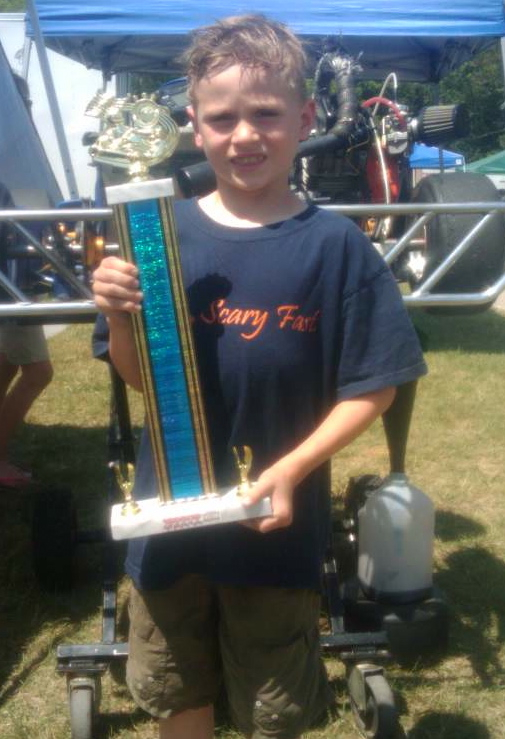 Last weekend we traveled to what is now called Briggs & Stratton Raceway Park to race with the Badger Kart Club. A few weeks ago we had our first practice at what was then called Badger Raceway. Having heard that they have up to 24 Kid Karts this year we decided that we should join them for a race and see how it goes. We were not disappointed. I was very impressed with race day. The club safety techs every kart before every race. Without a tech sticker, you do not race. We got our kart inspection sticker without any trouble. They also tech every helmet. Sadly, Jason’s helmet was only DOT certified and Badger requires SNELL 2005. Without missing a beat, the guy that checked our stuff said he had a spare kid helmet and had Jason try it on. After much pulling on the helmet, while it was attached to Jason’s head to make sure it fit, we were ready. I never got his name, never gave mine, he just lent us a helmet without question. I wish I was able to thank him personally at the end of the day, but could only find his son to pass on our thanks. Badgers race days are fast and very well organized. They have a 100 or so racers and a dozen classes to manage. The Kid Kart classes squeeze in two practice sessions and two races between 10 am and 1 pm. There are two Kid Kart classes that they run separately – “regular”, for kids who know what they are doing and “novice” for the beginners. Jason was in the regular class and his practice sessions went very well. He started both of them in the back of the pack, which is fine since he is new to the track. He ran very cleanly and finished near where he started. He was able to make some passes and was passed without incident. His first race he started 3rd. After being passed by two karts at the start he held his own in 5th, until, the battle in front of him caused two karts to spin and put him back in 3rd. That is where he ended the race. For the second race Jason started on the poll. He has not yet figured out how to start a race and lost 7 positions right off the start in the first corner. Later, he was passed by the other #99 kart and passed #74 right at the end for 8th place. Overall, a really good day of racing. Jason’s favorite part was the fact that he got a trophy. After the last races weigh-in the kids jump out of their karts, run to the track office in full gear, and pick out a trophy. The trophies are donated by older racers. This week’s thanks goes out to the helmet guy, Brian Julian for his advice and AC equipped trailer on the deadly hot weekend, my parents for coming and putting up with the heat and cheering on my son, and finally my awesome wife and daughter for coming, cheering, and letting us do this crazy stuff all summer long. This entry was posted in Race Results, Racing by ChiefDuck. Bookmark the permalink. Thanks for the plug Badgers.